Unfortunately despite a huge effort to remove weed and keep the venue functioning, sadly the decision has been taken today, 26.07.18 to close down until such time that conditions improve. With very little flow into the lake and the extreme heat the algae has now finally taken hold, rendering fishing nearly impossible despite repeated skimming and subsurface work. It would also be cruel to stock fish in such conditions. Thank you to Blair Woodland, Simon Autton, Chris Guest, Terry Humphries, Daniel Osmond, Andrew Berwick and John Ackhurst for all your assistance and strong arms recently. We tried our best! 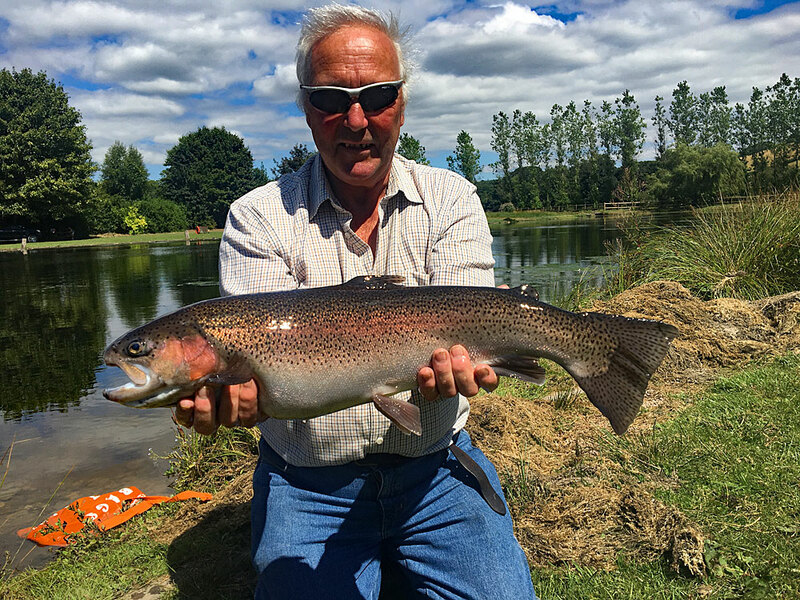 This past weekend we managed to keep the water clear and the anglers who fished caught some cracking Trout including this 7lb 8oz to one of the rods. Note the pile of weed pulled out of the lake in the background! A cracking 7lb 8oz fish caught on 21.07.18 ... but sadly the lake has deteriorated so much this week that the fishery will be closed until further notice. Rain is forecast but it will take a big influx of cool water and falling air temperatures to make any real difference. I apologise for any inconvenience this closure may cause but see no other alternative in the circumstances. We hope to see you when conditions improve because so far with the hard winter followed by the continued heatwave this has been perhaps the most difficult seasons for the fishery on record ... and we have had some tough ones!